See all Homecoming activities here. "Your support makes a major difference in our college experience and we couldn't do it without you. 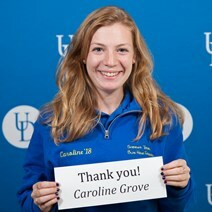 It's people like you that help to make my dream of attending UD come true." The University of Delaware is an equal opportunity/affirmative action employer and Title IX institution. For the University’s complete non-discrimination statement, please see our Legal Notices.